Saturday and Sunday were two great, packed, informative days! By the end of the Library of Virginia’s Annual Literary Luncheon, I was too caught up in events to write much, but that dam is about to break. 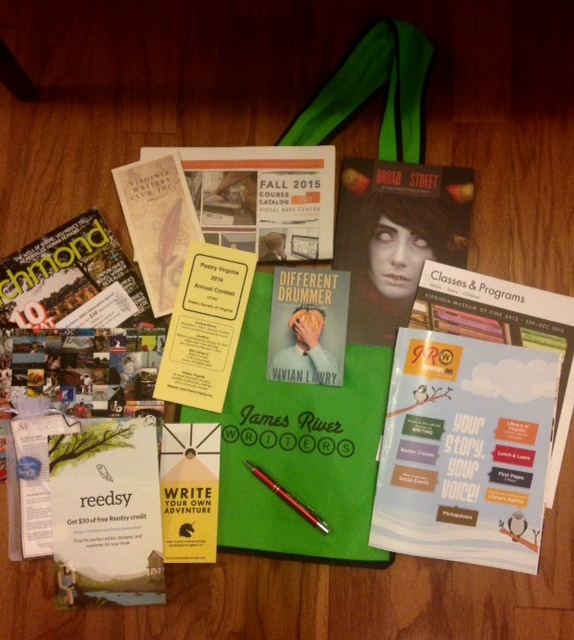 I’ve attended JRW Conferences since the earliest days, back when they were held at the Library of Virginia. I really liked that venue, the ambience, the close, personal feel of it. But the annual meeting outgrew the Library’s space. 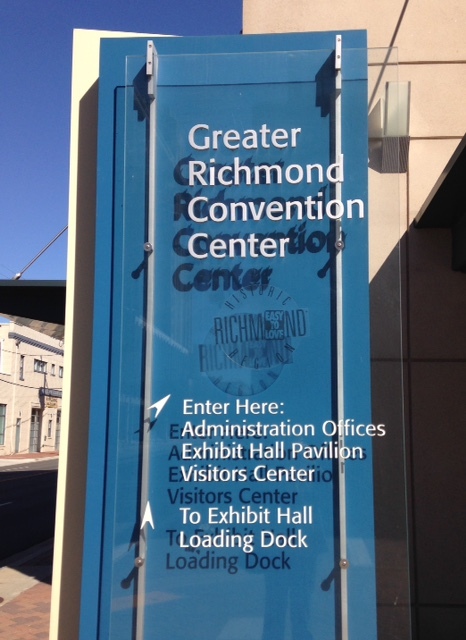 This year we met at the Greater Richmond Convention Center. It feels much more sterile, but there is plenty of room for meetings, plenary sessions, book signings and sales, plus convenient parking. Plenty of room for growth! On the other hand, last week I mentioned that JRW classifies sessions by track. This year’s tracks were Diversity in Writing, Writing for Kids/YA, Poetry, The Pillars of Story, and Writing as Career 2.0. I tended toward The Pillars of Story, but not exclusively. Freedom to jump the tracks is one of the delights of the conference. 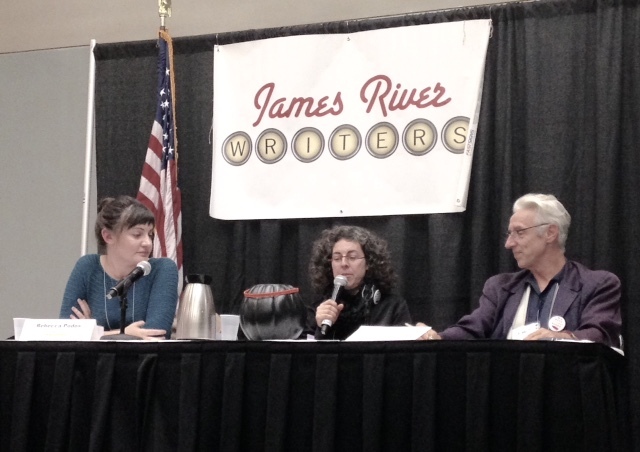 Hoping to find an agent for Nettie’s Books soon, I attended the session on getting the right agent (David Henry Sterry, Arielle Eckstut, Heather Flaherty, and Helen Heller, Bill Blume moderating). Although there was a lot of diversity on many things, (e.g., appropriate level of formality/informality) two areas of unanimity stand out: (1) research agents you intend to query; and (2) follow their online submission guidelines to the letter! The diversity of personalities on the panel was evidence that you (the writer) really should try to get a handle on your prospective agent as a person. Places to look are Facebook, blogs, Twitter, and any books the agent might have written. It also helps to hear them speak at a conference such as JRW, or meet them in a one-on-one session. I’m currently working on a new novel, and the first 30 pages or so are pretty ho-hum. The presentation on conflict and tension was excellent (Raising the Stakes with Leah Ferguson, Valley Haggard, and Amy Sue Nathan, moderated by Jon Sealy). They reminded me of multiple aspects of tension and conflict: stakes can be personal or universal; conflict can be internal or external; a blocked goal = conflict; focus on physical or emotional danger; in every case, imagine the worst possible thing that could realistically happen in this situation and write it—you can always dial it back later for nuance. One thing I found especially helpful was Valley Haggard’s comment that readers connect with shame, pain, vulnerability, failure, and flaws. I wish I had a picture! A Fine Romance (Leah Ferguson, Mary Chris Escobar, Amy Sue Nathan, moderated by M.M.Finck) brought genre into focus—women’s fiction vs. romance, into particular—and endings (happily ever after, happily for now, together but bittersweet because one or both had to sacrifice for it). Beyond that, what struck me is that their advice for writing a good romance or book of women’s fiction sounded just like the advice for good writing in general! Which reminds me: at the Festival of the Written Word, I’m on a panel with a title something like When Romance Meets Mystery. We shall see. Again, I wish I had a photo, but I was too far back in the hall. 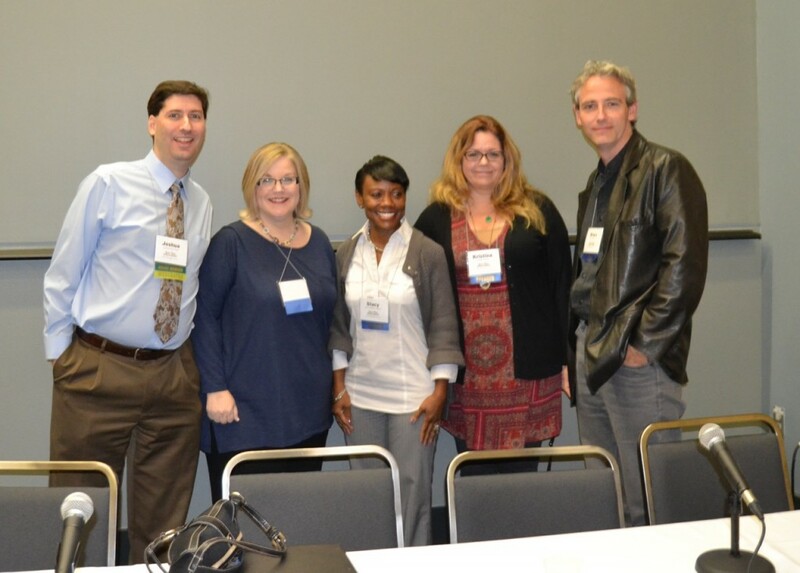 But I did get a picture of the panel for Writing Memorable Characters: Stacy Hawkins Adams, Bruce Holsinger, Amy Sue Nathan, Kristina Wright, moderated by Josh Cane. The variety of writing represented—inspirational women’s fiction and non-fiction, historical fiction, women’s fiction and romance, erotica—underscored the over-all rule that every type of writing (including memoir) needs memorable characters, and characters the reader cares about. The heroes and heroines need flaws. The bad characters need a good side. And one effective way of establishing both is to give readers the backstory. 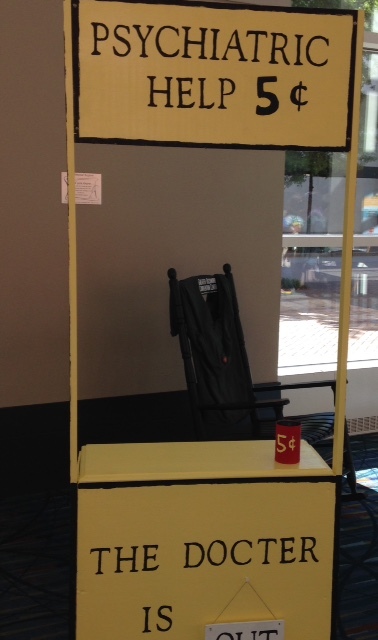 The last plenary session was the Pitchapalooza (David Henry Sterry, Arielle Eckstut, and Rebecca Podos) during which the names of volunteers were drawn from a plastic pumpkin and each had 1 minute—precisely one minute!—to pitch his/her book. Great fun, and very informative as the panel commented on the stronger and weaker aspects of each pitch. The closing was brief, but celebrated the winners of the Best Unpublished Novel Contest, the Emyl Jenkins Award, and Pitchapalooza. Although not a winner, I was recognized as a finalist in the Best Unpublished Novel Contest. Very gratifying. But egocentric being that I am, I wish the awards (except Pitchapalooza, of course) had been announced a the beginning of the conference. Maybe people I didn’t know before would have congratulated me! Alas, the conference wasn’t all about me. 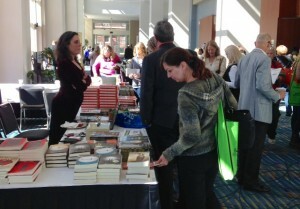 It was mostly about the books—and there were many to be had, and signed. Fountain Bookstore sold the books of all the presenters. I usually come away from the JRWC feeling that I got more than I paid for. Unfortunately, this year, that included a raging cold, including coughing and congestion, that laid me low as of Monday morning. I assume it was all the back-slapping, handshaking, and hugging. On the other hand, a nasty cold was a great reason to put my feet up, review my notes, and enjoy the contents of my conference bag. I checked the writing classes offered by VMFA Studio School and the Visual Arts Center; considered invitations to submit to the next Poetry Virginia Annual contest and join the Virginia Writers Club; and I could browse the free issues of Richmond Magazine and Broad Street. Already looking forward to next year! Though I did suggest to Katharine Herndon (JRW Executive Director) that next year they try to get a bright colored conference bag!